Sakarya University has been awarded the Global Excellence Award by the European Foundation for Quality Management (EFQM). Sakarya University, which applied to the 2018 EFQM Global Excellence Award held by the European Foundation for Quality Management (EFQM), won two different awards. The award ceremony was held in Vienna on October 18, 2018 and Dr. Fatih Savaşan, Vice Rector Prof. Dr. Barış Tamer Tonguç and Sakarya University Academic Evaluation and Quality Improvement Board (SAÜDEK) Coordinator Assist. Prof. Dr. Tuba Canvar Kahveci have participated in the event. Sakarya University had applied for the 2018 EFQM Global Excellence Awards last February. Subsequently, volunteer assessors from Europe had made a site visit to Sakarya University on 14-18 May and performance results of the university were evaluated comparatively. Thus, the university’s score was determined by EFQM Excellence Model standards. According to the feedback report prepared as a result of all these evaluations, Sakarya University has been awarded two Achievement Awards; “Adding Value for Customers” and “Developing Corporate Skills”. Also, Sakarya University’s practice in three areas was determined as a role model at the international level. These three areas identified by the team are Sakarya University Information System (SABİS), the student-centred education-teaching approach and developing equally in all areas. 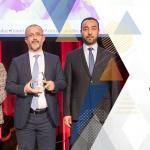 With the “Adding Value for Customers” award, Sakarya University has been recognized as continuously adding value by understanding, anticipating and meeting the needs, expectations and opportunities. The University’s other award “Developing Institutional Skills” shows that the SAU has succeeded in developing its ability to effectively manage change within and beyond its organizational boundaries. Sakarya University’s quality journey has begun in 2006 and won the National Excellence Award in 2010, the Sustainability in Excellence Award in 2013, and the EFQM Excellence Award in 2015.